start a radio career in Germany? Well - nowadays the best way is: No useless education, reject any payment offers, volunteer washing of the car of your boss at the weekends, good knowledge of a radio program automation software, fluent pronounciation of the word "voice tracking" and a glimpse at the "Bild-Zeitung" (a german tabloid) from time to time. In former times it was a bit different (listen! grandpa tells fairytales from the stone age! ): The first "radio" steps for me where in the mid 70s of the last century on 27 Megacycles (or Hertz) with 40 channels and 5 Watt AM ERP (CB radio of course - if I'd had 28 channels less and only 0.5 Watt it would have been legal here in Germany - don't tell the cops - it's too long ago for legal action). Nevertheless I could sometimes reach Hampton/Virginia from my tasteful coloured youth room - with Turner amplifier mike (down left in the pic) and 5/8 lambda fiber glass antenna at the balcony (usualy used on cars). Of course nobody could watch TV unjammed in the house when I was transmitting. 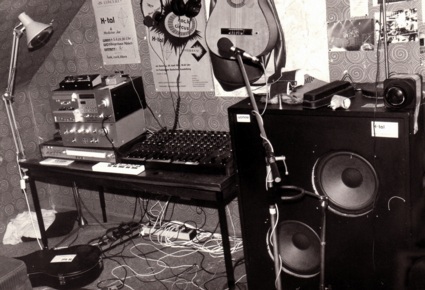 After some years funky radio was replaced by funky music because singers like Gary Glitter, Alice Cooper and guitar heroes like Nile Rodgers forced me to play electric guitar, founding a band and turning my room into a mini studio. A friend built a huge speaker box for my guitar which would be capable of hiding all the WMD Mr. Bush still seeks in Iraq. It was built after my plans so I couldn't blame the friend that this box sounded more than lousy. I never used it again after the first try. My parent's home became more and more limited for my space and acoustic needs so I had to take a job and a own appartement (to avoid the word "shelter"). A local newspaper was brave enough to offer a guy with a very mediocre high school degree a 2 year education to become an editor. Maybe they where seduced by my former trials as a publisher of a pupils newspaper with a monthly circulation of 1,000 - financed only by ads and distributed for free at all high schools in the city. In the little spare time I served my 2nd passion motorsports - with some Enduro bikes on cross tracks and as a bike- and car tester for some magazines and the newspaper (e.g. 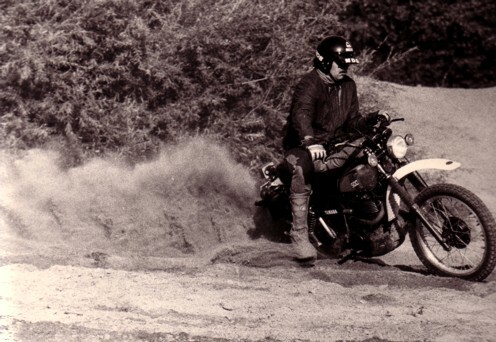 the test for the 10th birthday of the classic Yamaha XT 500, pic down right). 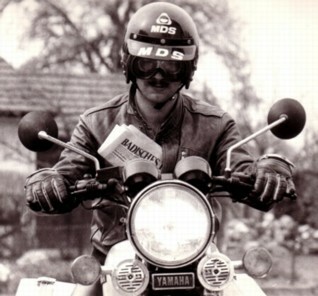 My report about the biggest european biker meeting at the Contidrom near Hannover was made multimedia: printed and as a little (and very bad) radio report in germans biggest youth radio SWF 3 - my first step into radio - hoorray! 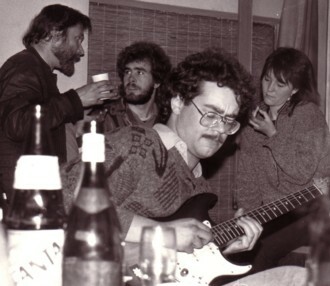 Playing music played more and more a minor role - sometimes at New Years Eve parties with listeners that were forced to stay with lots of alcohol (down left). 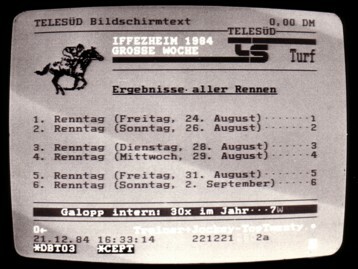 "Explore new borders" was the motto for the mid 80s: The german Bundespost started the Internet predecessor Screen text (Btx), at first in the teletext like "Prestel"-norm, later in CEPT which had a bit more details and pixels. The local newspaper founded an own division to be a content provider including a real time news service which sometimes worked 24 hours a day (e.g. at the Olympic Games). You may have guessed that I joined this division because I always wanted to be on top of new developments (down left you see an example of a Btx page for the horse races in Baden-Baden 1984). 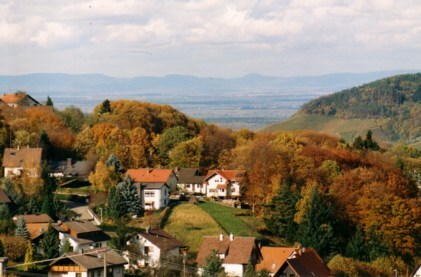 Another challenge was the first local radio in the state of Baden-Wuerttemberg (Stadtradio Freiburg) where the local newspaper was one of the partners. Of course I joined the project for a one-month-practical training. The airchecks of my first reports and news are nowadays used in jails worldwide to force confessions out of the poor prisoners. Nevertheless it was a good training and the listeners had always the possibility to turn the radio off. 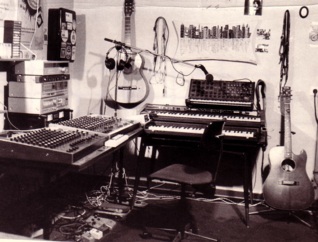 The private living room (above right) had since turned into a middle sized audio production studio where I produced higly complicated and extremely noisy tracks with 2 cassette recorders with the "ping pong" method replacing a multitrack machine. The amount of effect devices (on the bottom) was in vice versa relation to my musical skills. The same chaos as in my living room must have been at that time in the brains of politics that built the legal conditions for private radio in the state. Until then we only had some kind of public radios. They gave the licences and frequencies for too small regions to multiple candidates. One of them was of course the local newspaper I still was working for. 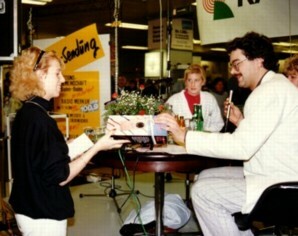 1988, after 5 years as an editor I was one of the builders of a local radio called "Radio Merkur". 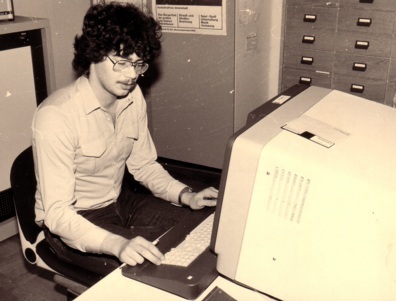 That included all the work to install a technical and journalistic infrastructure. 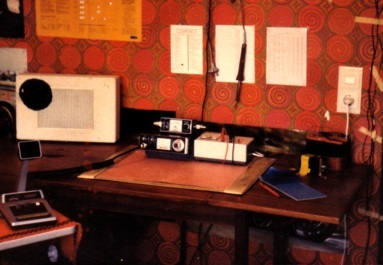 You may not believe it but the first test programs and station IDs where produced in my living room "studio" above right because the radio itself had no technical equipment at that time. "Congratulations - you won!" 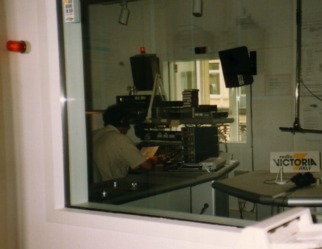 was one of the favourite phrases soon after at several field live shows in department stores of the region (above left), up to 7 hours program per day where produced in the city studio with less than 10 employees, the rest of the program came per satellite from Radio Luxemburg (RTL) that spend us radio newbies some weeks of training before we started our own program. It took only half a year to climb the career ladder like a rocket: From vice studio boss to studio boss - the former boss was shot back to the newspaper because of total incompetence. Unfortunately not all of the morons - especialy in the management - where forced to change to other companies. So I left the station at the end of 1988 with the best the radio could offer: An extremely capable audio technician called Iris Trenkler. 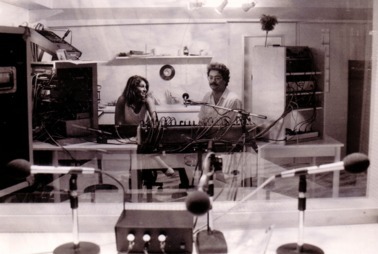 Together we started our own business - with two brandnew tape machines (Studer/Revox PR 99 MK III) and the equipment I already had in my living room. We aquired and produced commercials, bought airplay time und worked free as show host and technician for some local and regional stations (e.g. down left for Radio 7 Victoria in Baden-Baden). 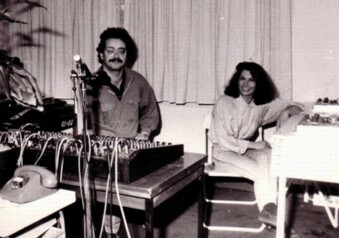 The official founding of the company Spectrum word- & music production was in 1989 and the business started so well that we could build a new studio after a move to another house. The giant double glass window between recording room and mixing hall could be refinanced in less than a decade - big deal! In other words: After the next move in the little black forest community Buehlertal we build the studio 2 scales smaller - the average voice talent doesn't need more room as a dog in an animal asylum. More space only costs the money of the customers and they don't have that money any more. As a compensation you get the beautiful view over the rhine valley for free - invaluable. 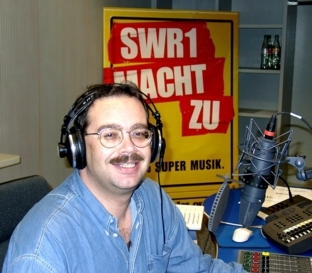 After each time about 4 years of hosting shows at Radio Victoria, Radio RPR (Ludwigshafen) and Radio Regenbogen (Mannheim) I worked from september 2001 to december 2009 for the public radio SWR 1, until the end of 2003 as part of the company Spectrum, afterwards as a freelancer as host and sometimes editor of the night show from midnight to 5 a.m. at weekdays and to 7 a.m. at sundays. 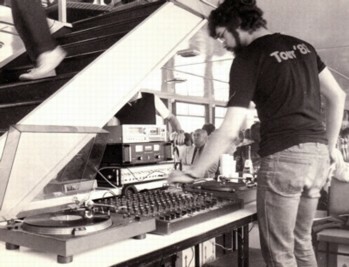 In addition I was one of the four hosts of a special music show called "Kopfhoerer" (which means headphone, see pic above right) monday to friday from 10.30 p.m. to midnight. Since spring 2009 I'm also working sometimes as german overvoice for the news show at german/french "ARTE TV". Besides this radio und TV jobs I'm recording and distributing voice productions via data transfer (in every format you like - from mp3 to wav.) per DSL for companies worldwide - from the german telephone announcement for a flag company in scotland to the german voice on a commercial CD-ROM of an agriculture machine company in the U.S. province. 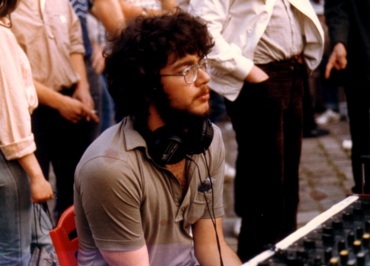 The same voice has already been heard in german television and in cinemas and of course in numerous radio commercials between northern Germany und the italian Lago di Garda (where there are also german radio programs). These files are recorded in my own studio with 2 Mac computers (with ProTools) and some peripheric equipment. If you have a service or media production that needs a german voice you can contact me over this e-mail-adress. I will answer as soon as possible.